Meet 3 who have helped on every Crusade! Watch this feature story that aired last week on WHAS11 News at Four. It’s reported by Melissa Swan. Just like he did in 2004 and 2006, Peabo Bryson will headline the 60th Annual WHAS Crusade for Children on Saturday, June 1, 2013 at the Kentucky Center’s Bomhard Theater in Louisville beginning at 7:00pm (EDT). With hit songs, “If Ever You’re In My Arms Again,” “A Whole New World,” and “Beauty And The Beast,” Peabo is a crowd pleaser who never fails to entertain. The WHAS Crusade for Children is America’s most successful local telethon. On June 1 & 2, 2013, The 60th annual WHAS Crusade for Children will be underway! With the tradition and goodness of past years, thousands will come together to celebrate…celebrate making life better for children with special needs. As part of that milestone, you’re encouraged to donate $60 for the 60th! If everyone does, 2013 will be a banner year. The Crusade’s history is based on many people giving a little bit. But for the 60th, if everyone gives $60, the Crusade will reach new heights. Nearly 200 fire departments along with hundreds of organizations from Kentucky and Indiana will report how much money they’ve raised for Kentuckiana’s children with special needs. 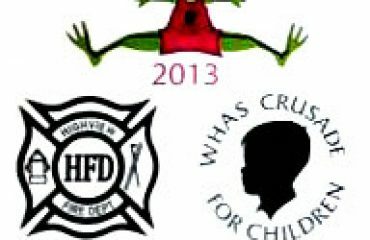 Each year firefighters collect nearly 60 percent of all Crusade donations by staging road blocks and other events, they’ll be ready for the 60th Annual WHAS Crusade for Children June 1-2, 2013. Melissa Swan of WHAS11 News and 84WHAS Radio’s Terry Meiners will MC the Crusade. They will be joined by favorites Patrick Hughes; The Miracle Dancers; The Diane Moore Dancers; Todd Hildreth and the Crusade Quintet plus so many more to be announced. The annual Crusade Internet/radio/telethon kicks off at 1:00pm (EDT) on Saturday, June 1 and will air in its entirety on WHAS Radio (AM 840), WHAS-TV (DT Channel 11.1) and worldwide on WHAS11.com. Ted’s been a valuable volunteer every year for the Crusade. Give $60 for the 60th! in Ted’s honor. He joins Milton Metz and Bob Pilkington as the three who have been a part of every Crusade since 1954. There are thousands of others who make the Crusade an annual commitment. Join the team! Thanks to all who make the WHAS Crusade for Children America’s most successful local telethon. Purchase 60th Crusade Merchandise NOW! The holidays are rapidly approaching and just in time are the perfect gift ideas! Crusade 60th Anniversary merchandise! 1. Download the Crusade Merchandise flyer by CLICKING HERE.